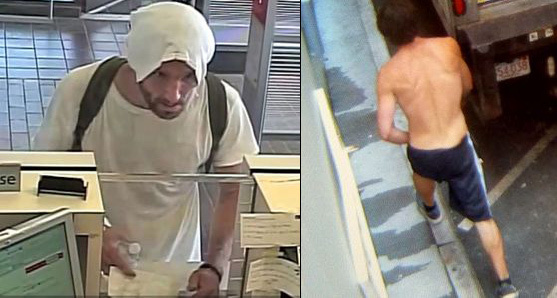 The FBI's bank-robbery task force has released photos of a man who held up the Santander Bank branch in Kenmore Square around 12:30 p.m. on July 5. He's described at 5'9" to 5'11" with a thin build, in his 20s and with a large tattoo featuring wings on his chest. If he looks or sounds familiar, contact Trooper Steven Wohlgemuth at 617-892-0145. If arrested, he should try to get his venue changed to that North Shore courthouse and appear before Judge Feeley. Remember Judge Feeley? He’s the guy that dismissed the charge against that heroin dealer because, according to the knowledgeable jurist, the heroin dealer was only seeking drugs to make money. I assume this fellow was only robbing the bank to make some money, so why would we want to lock him up? Just leave the poor guy alone. He has a right to make money just like anyone else. He deserves the same rights as a heroin dealer, as far as I’m concerned.